Sometimes, particularly around Valentines day, it can get a little bit rough trying to find a life (or momentary) partner. Animals suffer a similar sorrow, but some of them have evolved neat tricks to get around that whole need-mate-to-make-babies shtick by cloning! That's right, Dolly was pretty heavily pre-empted by reptiles, including a population of Plateau Striped Whiptails right here in Oregon. This species (Aspidoscelis velox) is made up entirely of self-cloning female lizards. Now you might think that clone babies don't have a whole lot to do with lesbianism, but you'd be wrong. Some lady whiptails will exhibit male behavior in the presence of other females, which causes the receiving lizard of the duo to ovulate and thus become pregnant with wee duplicates. 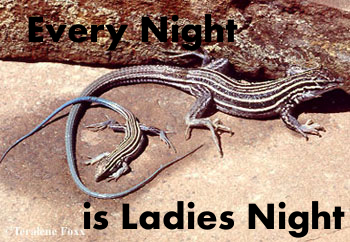 Lizards which engage in roleplay are more likely to get self-knocked-up. Personally, the Vengeance Team is particularly grateful this is not a trait shared by humans. God only knows what chaos would ensue from an Old Spice commercial. While a clone baby of either VT member would be super awesome and naturally gifted in every way (except height for one poor clone), it would be really hard for us to resist pranking each other into pregnancy. Come on - if all you had to do was puff up your chest and speak in a gravelly voice in order to knock a lady friend up, wouldn't you think it was kind of funny? Neither member of the Vengeance Team can really lay claim to the kind of maturity and restraint a world like that would require. Sorry, Mini-Me(s). It's just safer this way. Price, A. (1992). Comparative behavior in lizards of the genus cnemidophorus (teiidae), with comments on the evolution of parthenogenesis in reptiles. Copeia, 1992(2), 323-331. Crews, D. , Grassman, M. , & Lindzey, J. (1986). Behavioral facilitation of reproduction in sexual and unisexual whiptail lizards. Proceedings of the National Academy of Sciences of the United States of America, 83(24), 9547-9550.